Carnival Glass never ceases to give pleasure and delight, but it is also a fickle creature that teases and torments. Just when you think your research on a pattern is “done and dusted”, something happens to stop you, so you re-assess what you know. Exactly that happened with the Garland and Bows pattern. We had it pegged (or so we thought). There were two variations to the pattern—one made by Riihimäki in Finland and one made by Hortensja in Poland. But then Lesley Smith made a serendipitous purchase on eBay which turned things upside down . . .
Two shapes are known in Carnival and are illustrated in Riihimäki catalogues—a creamer and a handled sugar (shown above left). Both are currently known only in blue Carnival. Several other forms of Garland and Bows sugars and creamers are also shown in Riihimäki catalogues, but only 6635 and 6636 (right) have so far been found in Carnival. The top edge of both items is gently scalloped. Two stemmed shapes are shown in the Hortensja catalogues we have studied - 236 and 261, shown right. Other shapes may have been made, but these are the only two we have found so far. The top edge of the large centrepiece, 261, has a distinctive flute shaping. The garland and bows motif is repeated on the foot of both items. Most importantly, the bow is integral within the chequered band, unlike the Riihimäki version where the bow is below a beaded band. So, we have the Riihimäki version of the Garland and Bows design, where the bow lies below a row of beads, and the Hortensja version of the Garland and Bows design, where the bow is integral within the chequered band. On that logic alone, we might be tempted to say that Lesley’s blue berry bowls (shown below) must be from Hortensja in Poland. But, other characteristics of Lesley’s berry bowls don’t fit with what we know to have been made in Poland. The colour is wrong—no cobalt blue Carnival has yet been reported from Hortensja, so that tends to point away from Poland. 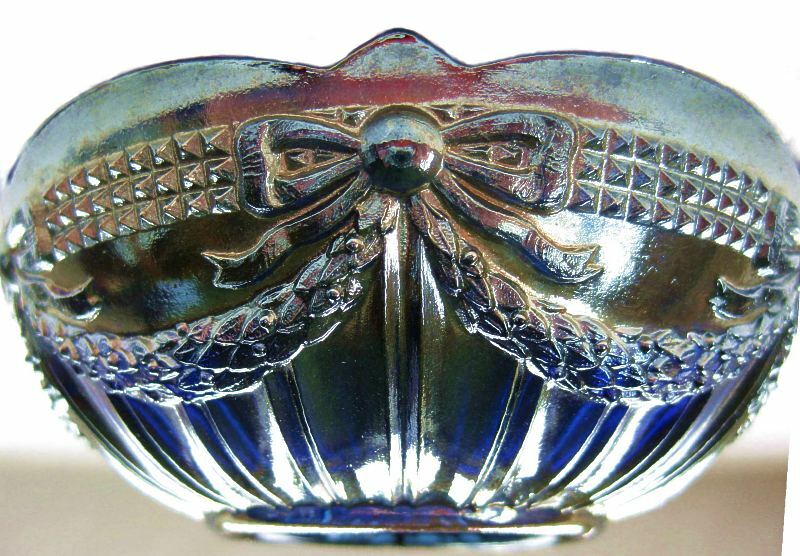 The collar base on the little berry bowl also feels wrong for Hortensja. Typically we would expect to see a ground base (stuck up rather than snapped up) on Carnival from the Polish maker. So who made these blue berry bowls that Lesley bought from Argentina? The pattern is identical to the Hortensja version, but the colour and the collar base are contra-indicative for Polish Carnival. We’ve already ruled out Riihimäki in Finland, so where does it leave us? It’s unlikely that the moulds were shipped from Poland to another country, possibly Argentina. This doesn't make sense for many reasons (economical and political). Could the Polish factory have made a special order in blue for Argentina and exported it to them? An unlikely, expensive and impractical proposition (again, for economical and political reasons). We developed a theory: what actually moved was the people! Between circa 1918 and 1938, population movement from Poland into South America was actively facilitated, in fact it’s fair to say that there was mass immigration from Poland and they even had a special plan: in the mid 1930s the Polish Ministry of Foreign Affairs established a Polish colony in the triangle between Brazil, Paraguay and Argentina. The government bought land in the region and initiated two Polish settlement outposts. We imagined what a Polish glassworker might have done in these circumstances, as he embarked on a new life in South America. He would have wanted to use his skills, but he wouldn't have had a CV or a portfolio. So maybe instead, he would have taken with him some glass items, perhaps some mould drawings or patterns, catalogues even, so that he could say "this is what I did - these are my skills". So, that was our theory. Polish emigrants who settled in South America effectively took the pattern concept with them. The finish, the style, the overall look of the pieces, however, took on the signature characteristics of South American Carnival. Our research has uncovered some amazing fresh evidence to prove that indeed the maker was South American, but that Brazil and not Argentina, was the South American country involved. The pattern is called Lacinho in Brazil. Not only do we now know the country of manufacture, but we also know the actual maker. 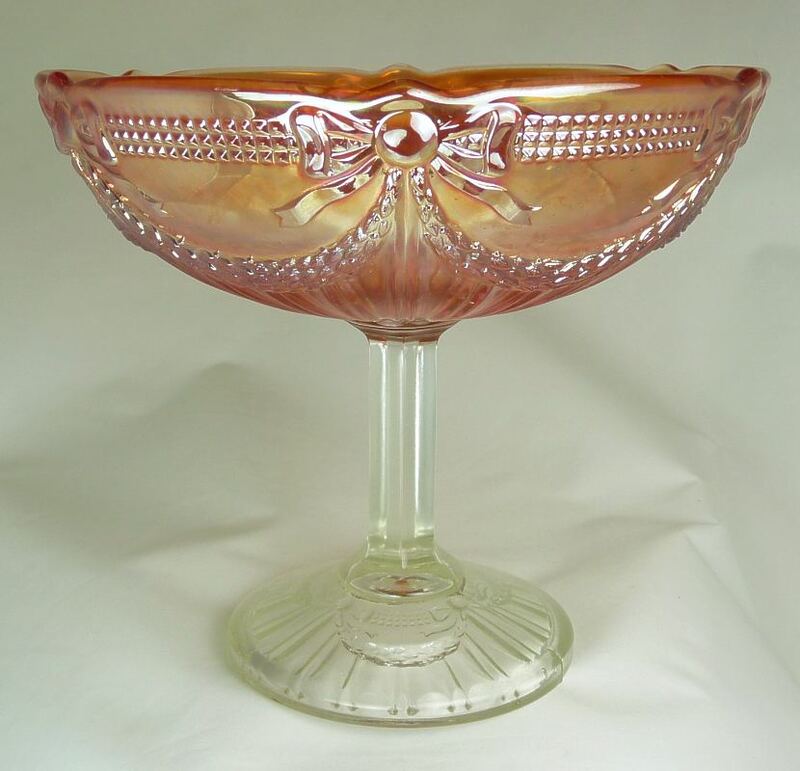 The proof is here: Garland and Bows bowls with ESBERARD RIO moulded inside - Carnival Glass from Esberard, Rio, Brazil. 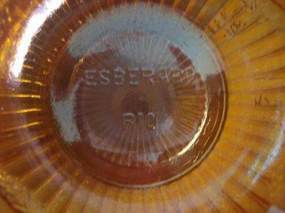 If the item is marked (Riihimaki or Esberard) then that’s easy – but what if there is no mark? Colour can help a little – if it’s blue then it’s NOT Hortensja, but it could be either Riihimaki or Esberard. If it’s marigold, that opens it up, as all three makers produced marigold. What about pattern differences? Riihimaki used a beaded band around the top and the bow lies wholly below that beaded band. Hortensja used a checkered band and the bow lies within it. But it appears that Esberard used both beaded (with the bow below) and checkered (the bow is within) bands, which altered on the different shapes they made. Hopefully further study and the emergence of more examples will help to clarify the situation. Meanwhile, the location of the “finds” will often point to the likely maker. It’s not foolproof, but it helps. Covered bonbonniere marigold (right) – does not have a ground base, almost certainly South American. Berry bowl blue - does not have a ground base and is almost certainly South American. Large 10” master berry bowl marigold – unsure of details, but almost certainly South American.